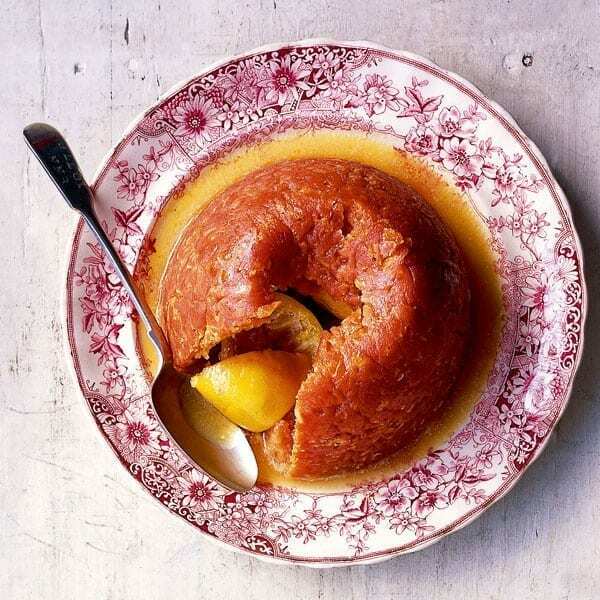 Add a touch of old-world glamour to your table with this classic British pudding. We can assure you that this tastes nothing like pond water, rather, it is an intensely lemony sponge; ideal for people who don’t want too much sweetness in a pudding. Prick the lemons all over with a skewer. Cut the butter into fine dice and chill. Combine the flour and suet in a bowl and add the milk. Knead to form a dough. Divide it into 2 rough balls, comprising of a third and two-thirds of the mix respectively. Flour a worktop and roll out the larger ball. Use it to line the base and sides of a buttered, 1.5-litre pudding basin. Fill the pudding with half the cold butter cubes and half the sugar. Pop the whole lemons on top, then top with the rest of the sugar and butter. Roll out the smaller ball of dough to make a lid for the pudding (this will become the base so make it nice and thick). Brush the edges of the lid with water, put on top of the pudding and press to seal. Cover with a circle of baking paper and tie under the rim of the basin with kitchen string to secure. Before cutting the string, take it up over the top to create a loose handle, then tie securely. Trim off any excess baking paper. Place the basin in a large pan and pour hot water into the pan until it reaches two-thirds of the way up its sides of the basin. Cover and simmer for 3½ hours. Keep an eye on the water level, and top up as necessary. Allow the pudding to rest for 10 minutes before carefully turning out onto a serving dish. When serving, ensure everyone gets a little of the lemon.